This antique George V sterling silver kettle on stand has a plain circular rounded form with a waisted upper portion and a flared swept rim. The surface of the kettle is plain and unembellished. 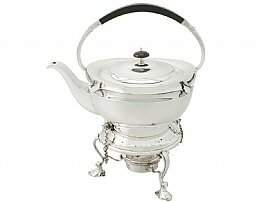 This antique silver kettle is fitted with a plain subtly domed hinged hallmarked cover surmounted with the original circular wood and sterling silver finial. This fine example of antique teaware is fitted with a large, plain rounded handle with a central carved painted wood handpiece and sterling silver bifurcating lower terminals. The kettle detaches from the original hallmarked sterling silver stand, supported by three impressive bifurcating scrolling legs terminating with leaf decorated feet. The upper portion of the stand is encircled with an undulating band of pierced circular motifs. The stand incorporates a plain frame which retains the original detachable spirit burner incorporating a hallmarked hinged snuffer. The spirit kettle stand is fitted with the original chains and hallmarked security pegs. This antique sterling silver spirit kettle is an exceptional gauge of silver, exceptional quality and in excellent condition. Full hallmarks struck to the surface of the kettle and stand and part hallmarks to the interior of the cover, interior of the snuffer and the security pegs are all very clear in keeping with age. Reflections in photographs may detract from the true representation of this fine silver kettle on stand. Height to top of handle 28.7cm/11.3"